AIDS Memorial Quilt, via Wikimedia Commons. I got the shivers when I read that a quilt was to be laid out on the Mall in our nation’s capital as one of three main sections of this year’s Smithsonian Folklife Festival. Let’s face it: Crafts in this society (and many others) are the maligned stepchildren of “real art” or “real work,” often thanks to being the purview of women. As an artist and a woman, and as someone who often creates work out of bits of nothing, trash, and scraps of this and that and spit and a wee bit of polish, learning that a quilt would be on the Mall in a world-renowned festival was nothing short of shocking. What makes this all the more incredible is that the quilt in question is the AIDS Memorial Quilt, which went on display on June 27. Not only does it highlight something crafted from unrefined bits and pieces by non-professional artists, but at its core is a message that comes from the margins of society, woven through activism, death, tragedy and a fight to be remembered rather than forgotten. These aren’t exactly the first things that one would expect from the often-conservative Smithsonian Institution — which reflects how far into the mainstream the grassroots movement for AIDS justice has come. It has been 25 long years since the first quilters gathered in the Castro in San Francisco to piece together the original memorial panels, which now number about 48,000. And, for the first time in the 30 years since the virus’ discovery, we now have the science and know-how to end the pandemic within a generation — if we would only use our political will to dedicate the necessary resources. As it turns out, the International AIDS Conference will be taking place in D.C. as well, returning to the United States for the first time in more than two decades, along with what are sure to be many accompanying demonstrations. The face of AIDS has changed as well; what was originally thought to be merely a gay men’s plague now infects more women around the world than men. So, more shivers. Art, or cultural work more broadly, has a way of reaching people beyond the brain, of grabbing us in the gut, of speaking truths without words. I think of incorporating cultural work into our lives as the most powerful way to reclaim our world, and to fight corporate homogenization that tells us that we don’t matter as individuals, that what we bring to the table doesn’t count. When we bring our culture, our skills or, at least, our willingness to be creative, we regain our personal capacity and agency; with a collective collaborative project such as the AIDS Memorial Quilt, we also build community skills, organizing tools, emotional and physical support networks, and group power on a huge scale. The Quilt is considered to be the largest community art project in the world, so large in fact that it would take 33 days to see it if you spent only one minute on each panel. It’s craft gone monumental. Feminists of the 1970s helped expand the definition of art to include traditional crafts — opening the door for marginalized communities and their cultural expressions to be included among the legitimate expressions of beauty, documentation, vision and more, even if the form they take is pottery, tapestry, cooking or quilting. The Quilt’s 50 square miles of memorial ties together the long history of art and activism with craft, providing a powerful focal point in the communities most affected by AIDS. Quilts have been used before in activist and political contexts — telling stories and preserving heritage, whether intentionally or not. African-American slaves threaded the stories of their lives and their struggles for freedom into the quilts they sewed together, sometimes providing maps to escaping slavery through the Underground Railroad on the quilt itself. Chilean women resisting Pinochet’s regime in the 1970s used a traditional cultural tapestry form, arpilleras, to smuggle information and document the atrocities of Pinochet’s death squads. People everywhere have sewn their struggles into quilts or tapestries, designs from their hearts and expressions of their souls. Quilting can stitch it all together, with both physical and metaphysical layers of cloth and meaning. Having the AIDS Memorial Quilt in Washington, D.C., is a commentary on where we have been, where we are and where we might go. When we harness the power of cultural work and creative resistance in the service of survival and bettering our world, it is extraordinarily powerful. When even the mainstream culture begins to recognize the monumental nature of this work, and its gifts and its potential, that gives me shivers. 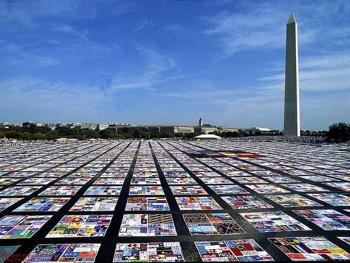 When I saw The Quilt the first time back in the 80’s, it was laid out on the National Mall in its entirety. Sadly, it wasn’t long before it could no longer be shown as one complete quilt. Thank you for writing about The Quilt and helping us to see a national tragedy responded to in Art. I was living in Washington, DC in the 1980’s and was at the original Quilt Exhibition that was a thrill. I also went to the Kennedy Center for a magnificent program. Recently, I was in New York and went to see the singer Baby Jane Dexter perform at the Manhattan Room. She was on the orignial program at the Kennedy Center and has continued to be a fantastic performer. What I can’t find on the Quilt2012 site or elsewhere is if there will be another Kennedy Center performance and who will be performing. Will Baby Jane Dexter and any of the original cast be included? It would be great to see that continuity, especially from those who were early fundraisers and supporters of the movement.